If you’re looking for a dental procedure which will replace a tooth which you have lost and replicate its functions, then you should look into getting dental implants. Dental implants are replacements for dental roots. Unlike other teeth replacement procedures which anchor the dental prostheses, such as the crown or the dentures, into the adjacent teeth or the surface of the gums, dental implants are anchored deep into the gum and bone tissues. For this reason, dental implants are more stable. Implant Fixture. The actual implant is the one which is buried deep within the bone tissue, and is made of pure titanium or titanium alloy. The reason for this is because titanium is the only metal which is capable of osseointegration, or fusion with the surrounding bone tissue. This confers more stability and strength to the dental implant. Implant Abutment. The implant abutment is a piece of rod which is attached to the implant fixture. 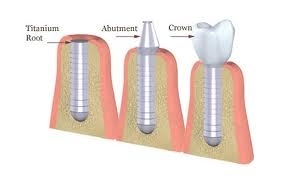 The abutment is found above the gum line and is the structure which the crown is attached to. Dental Prosthesis. The prosthesis is the dental work which is supported by the implant abutment. While most dental implants support crowns, they can also be used to anchor dentures into place. Dental works can either be screwed or cemented into place. Your dentist will have to evaluate the status of your jaw bone in order to make sure that your bone tissues are viable for dental implantation. To do this, your dentist will have to separate flaps of your gum tissue to expose the bone tissue. The jaw bone should be flat and smooth on top. If this isn’t the case with your bone tissues, your dentist will have to use a dental drill in order to reshape the bone tissue. Once your dentist has ascertained that you have viable bone tissue, your dentist will have to use a drill into which the dental implant can be attached into. Your dentist will make use of a small drill bit in order to create a divot. The divot will guide the drill so that the hole can be made right at the center of the bone tissue. Once the divot has been made, your dentist will continue to drill to create the pilot hole. The pilot hole will then be where the dental implant will be attached into.